Have a soft kitty protect your precious iPhone! 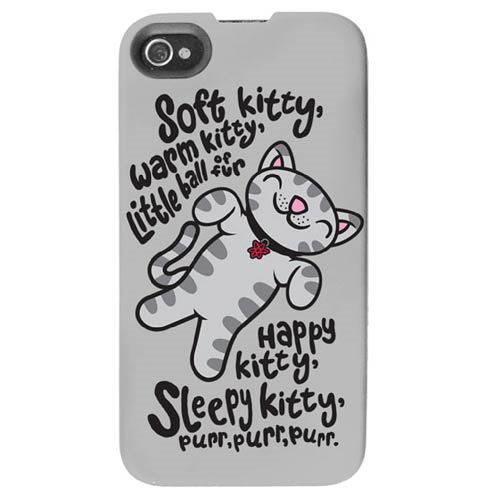 This Big Bang Theory Soft Kitty iPhone 4S Case features an image of the adorable soft kitty from The Big Bang Theory television show all happy and on its back, accompanied by the only thing that will calm Dr. Sheldon Cooper down: the words to the soft kitty song, "Soft kitty, warm kitty, little ball of fur. Happy kitty, sleepy kitty, purr, purr, purr." Made exclusively to fit on Apple's iPhone 4S, this case is the perfect item for any fan of Dr. Sheldon Cooper and The Big Bang Theory!